The much-awaited Republic Bharat is set be launched between today and tomorrow. 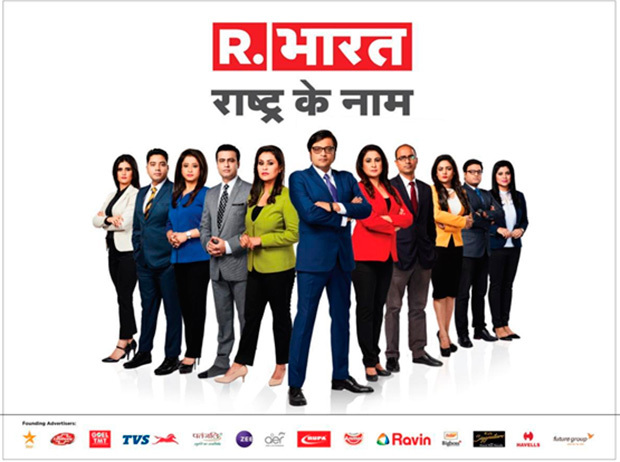 Just like the last year’s exhaustive advertising and marketing plan for Republic TV’s launch, Arnab Goswami and his team has left no stone unturned for the launch of the Hindi news channel. The campaign for the channel launch is centred around the theme of nationalism with the tagline ‘Rashtra Ke Naam’. Republic Bharat says it will launch a movement to fight for real causes, real issues, and real people from across the country. Republic Bharat’s launch campaign will reach out to 150 million viewers of the HSM market. To amplify the buzz and magnify the anticipation, the channel has partnered with Star Network to promote the launch across languages and channels. The deep partnership with Star Network has ensured the buzz for Republic Bharat tides into the large Hindi entertainment audiences of Star Bharat, Star Utsav, Star Utsav Movies, Star Pravah, Star Jalsha, Star Gold and Star Sports. The partnership has also ensured the penetration of the build-up for the channel into other large FTA channels like Enterr10, Dangal, Bhojpuri Cinema and Fakt Marathi with FCT and many non-FCT elements to engage with the vibrant Hindi-speaking audiences in the Hindi heartland and target both urban and rural audiences. In addition, Star Network’s English channels have also been leveraged to drive the message. Republic Bharat’s outdoor promotion spans over 700 hoardings spread across 53 cities in states such as Uttar Pradesh, Madhya Pradesh, Maharashtra, Gujarat, Delhi-NCR, Rajasthan, Chhattisgarh, Chandigarh, Punjab, Himachal Pradesh, Haryana, Jharkhand, Bihar, West Bengal and Odisha. Packing in an impressive display of the most credible and experienced faces and journalists in the Hindi news industry, the theme across the four creatives in the outdoor campaign is consistent with the brand slogan of ‘Rashtra Ke Naam’. True to its slogan of ‘Rashtra Ke Naam’, Republic Bharat has reached out to the masses through its radio campaign. A high-frequency radio plan executed over a span of 10 days with the largest radio networks across the country has ensured that the buzz around the launch is not missed. Partnerships with radio networks Big FM and Radio City have ensured that the messaging of the brand reaches Hindi-audiences in 42 cities in the important states of Uttar Pradesh, Madhya Pradesh, Rajasthan, Bihar, Jharkhand, Punjab, Haryana, Delhi, Maharashtra and Jammu and Kashmir. From the voices of India sending in their message of ‘Ab Hindi Ho Jaye’ to snippets from behind the scenes of Republic Bharat, which have been going viral on social media—the brand has aggressively used digital promotion to build up its big launch. The pre-launch campaign digitally has been the talking point for netizens and the brand has already garnered 1.1 billion Impressions in just a nine-day span. Republic Bharat has used every method, from traditional SMSes to WhatsApp communication, to drive its messaging. The mobile campaign alone has reached over 50 lakh viewers directly from the Hindi-speaking audiences. Adding a personal connect to the campaign, the brand launched its #ArnabKiDiary campaign, which made viewers directly connect with Arnab Goswami on the journey of Republic Bharat. Republic Bharat created over 73 videos that amassed a whopping 15.8 million video views. Republic TV created a day-by-day Twitter campaign and interacted with its Twitter audience to get over 3.2 million engagements. From its #RashtraKeNaam campaign to its #RepublicBharatKeLog messaging, the daily social media campaign has built the tempo and anticipation for the biggest launch in Hindi news television. Amar Ujala and Dainik Jagran will lead Republic Bharat’s print promotion campaign and will directly target audiences across the country. Special target focus for the print campaign is on mass Hindi-speaking audiences in key cities like Kanpur, Lucknow, Varanasi, Agra, Gorakhpur, Aligarh, Meerut, Bareilly, Moradabad, Dehradun, Haldwani, Patna, Bhagalpur, Ranchi, Dhanbad, Panipat, Delhi, Gurgaon, Noida and Siliguri to ensure that the news brand amasses maximum audiences from day one.